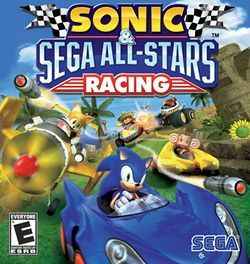 Sonic & Sega All-Stars Racing is a spin-off video game from Sega featuring characters from various Sega franchises. It plays similarly to the previous Sega game developed by Sumo Digital, Sega Superstars Tennis, including all-star moves. There are three different vehicle types (car, bike, and hovercraft) and available items on the course to speed up your vehicle or slow down an opponent's. The character roster and courses includes references to Shenmue, Jet Set Radio, Space Channel 5, Super Monkey Ball, Billy Hatcher and the Giant Egg, Bonanza Bros., The House of the Dead, Virtua Fighter, and other popular Sega franchises. This page was last edited on 30 May 2016, at 13:57.